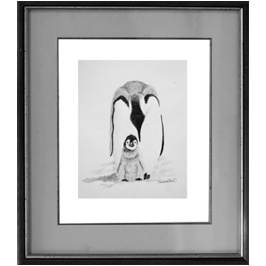 In my art studio there is one kind of bird that is drawn more than any other and that is the Penguin. My students cannot resist drawing the Penguin Family because the baby birds are so cute. The mother Penguin seems to hover over her little baby bird with so much love. So, we are going to have a lot of fun drawing the simple shape of the Penguin and then filling in the dark values. This is a very simple first project for those who have not had a lot of experience drawing and I know as a result of this project you will be encouraged to draw more and more.